These conference phones make sure everyone hears all the instructions and decisions, leaving no questions for when things do not work out. 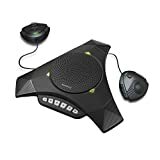 When you need to talk to a large group of people, this conference phone reduces background noise and lets you speak clearly. On top of that, when more than one person has to speak, 2 microphone extensions add to your range. Plus, its built-in microphone system provides you with 360-degree coverage so everyone at the table can be heard. All the phone controls are on the dial pad including a display for your customers’ phone numbers. The microphone range is about 10 feet. After you install this conference phone in your office, you can link up 4 additional phones to add to your reach. To make sure everyone can be heard, these phones come with a 25’ phone cord. No location in your conference room is out of its reach. Plus, built-in microphones give you complete coverage. Everyone can have their voice heard with these conference phones on the job. Also included in these phones are top-quality speakers so you can hear what is being said without trouble. The phone dial pad provides you not only with the numbers you need to dial. You also get mute and volume buttons, 3 programmable buttons and a lot more. Also, the digital display allows you to read your stored phone numbers with ease. Once you get set up, you get 2 built-in microphones and 4 wireless one to make sure everyone in the conference can speak their minds. The wireless mics give you up to 8 hours of talk time. 360-degree mic coverage makes sure everyone in on the conference can contribute easily. The microphones have a 7-foot range and works best in smaller rooms. Plus, the Polycom Acoustic Clarity technology ensures that everyone is heard with little to no interference. After you have set up the conference phone, you can use the dial pad with ease. It has 4 programmable buttons, a clear digital display for phone numbers and an assortment of other features. One finger should handle the phone dialing chore. Get into the modern technological age with this touch screen conference phone. No buttons to push or break, just touch the screen and get what you need displayed. The large display screen makes sure you see the information clearly. Also, its 2.4 & 5 GHz wifi compatibility you get more phone options at your fingertips. Once you get set up your conference calls should go much smoother and easier. Zoom support is also a part of this conference phone’s talents. With one button pick up or hang up, you can take or reject calls with ease. Then at the top of the display screen you will find the controls you need to adjust the volume. The large touchscreen provides more access to additional features. Also, the modern design should bring your conference room into the technological age. Avaya OmniSound technology makes sure that you hear everyone without trouble and allows you to be heard with clarity. After you hook this conference phone up, you get 720 by 1280p resolution on the large display screen. The 5-inch LCD touch screen then gives you access to all the features included on this conference phone. Also, you can hook up to 3 additional lines to this phone and the Optional Power kit provides you with extra GB midspan action. The Bluetooth 4.0 compatibility makes sure you have plenty of communication options. A 14-foot range gives you freedom of movement as well. 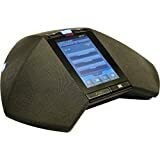 When you have a lot of people involved in your next conference call, this expandable conference phone handles the workload with ease. Plus, the Bluetooth feature enables you to use your smartphone as part of the conference call. 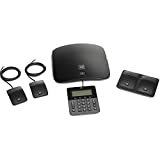 In addition to that, the USB connection port allows you to utilize web calling systems to cut your costs. 6 buttons handle all the features included on this conference phone. Also, each extension mic has a mute feature when people only want to listen and not be heard. This conference phone base system has al the features you could want. 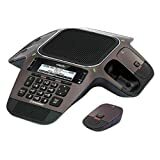 The conference phone has an external control pad to make accessing these features easily. Once you have the conference phone hooked up you can adjust volume and ring levels, along with adjusting the brightness level. On top of that, you also get call divert, message waiting indicator, auto-answer, call forward and a lot more. You are covered by this conference phone base system. It looks like it is from the future, but this password protected conference phone is just a technological upgrade. Equipped with Dolby Voice technology, you get great audio on every call you make or take. Once the phone is set up, you can access it from your computer and smartphone. That is after you get past the password protected security. Technology continues to upgrade simple business needed items like conference phones. Plus, it does its best to make sure you get all the features you need to make your conference calling productive. When you go with one of the top 10 best conference phones in 2019, you are getting the best technology can do right at your fingertips. That helps your business cut down on costs.